Hey you! Are your slippers not fulfilling all your fantasies? Looking a little worse for wear? Then chuck them, you don’t need that kind of negativity in your life! 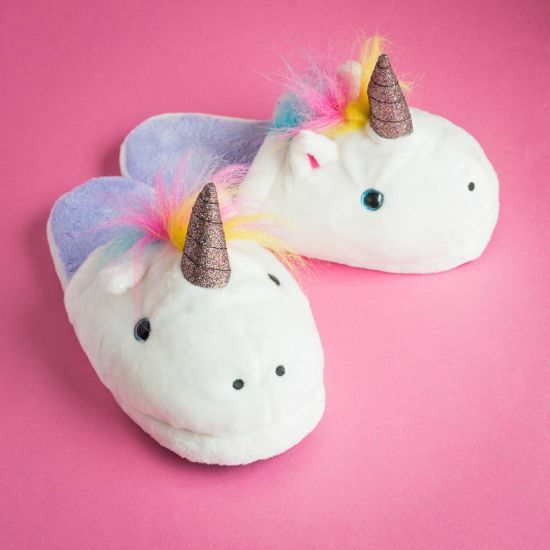 The Unicorn Slippers are here to turn that frown upside down and make sure your feet are kept nice and snug. In true Unicorn style, these ethereal beings are jam packed with all that magical, mystical stuff we love. Each Unicorn is covered in almost blindingly white fur, with bright blue eyes, a rainbow mane and a beautifully glittery horn to match. With rubber grips on the bottom to make sure you’re a steady stead and a soft lilac coloured lining to rest your weary hooves upon.